Free plans to build compost bin; make your own compost bin using our free simple compost bin design. Design Your Own Vegetable Garden Layout Using our Free "Vegetable Garden Planner" Software! Composting requires air, warmth, and moisture. Keep the compost moist by watering in dry weather or the materials will stop decomposing. Enclosed bins retain the heat which speeds up decomposition. 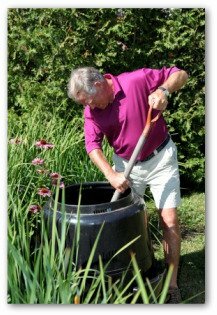 • An inexpensive way to build compost bin is to remove the bottom from a plastic garbage can and pierce holes in the sides. 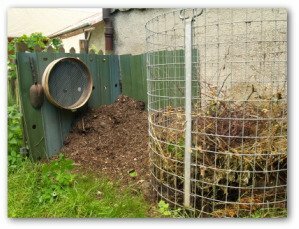 • Another simple idea is to wrap wire mesh around four posts to hold the compost. • A wire cage compost bin keeps material well-aired but may need insulation. Wrap landscape fabric, plastic, cardboard or old carpeting around the bins.• Make certain any plastic bins you use hold at least 3 cubic feet or the compost may never heat properly. • Purchase a 30 gallon metal waste container with a cover at any hardware or home improvement store. 1. Drill four holes in several different rows of around four inches apart in the can to allow air flow. Drill holes in the bottom and top of the compost bin to release excess moisture. 2. Place about three inches of saw dust or wood chips into the bottom of the container to help absorb moisture. 3. Placing the bin on top of a couple of cement blocks permits adequate air circulation. • Keeping the compost bin off the ground prevents rust and makes it less accessible to creatures that you do not want disturbing the contents. • Move the compost bin around periodically by basically shaking or rolling the can. • Add materials as they become available. The best compost bin is made of half dry materials and half wet. Composting can be sped-up by assembling a quantity of green matter waste, a supply of manure, and a generous sprinkling of fertilizer added to the top of each organic layer. Compost can be created in a single season with weekly watering and turning over at intervals of several weeks. Spread the organic matter over the vegetable garden in a 2 to 4 inch layer or fork into the soil in spring or fall. 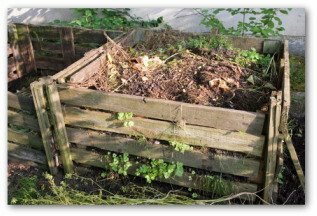 Build a compost bin to have beneficial organic material on hand. Add compost generously to the dug holes before you plant vegetables such as tomatoes, peppers, or lettuce. Dried weeds, animal waste, and lawn clippings can be rapidly turned into compost. Mix in vegetable and fruit leftovers, coffee grounds, tea bags, horse, rabbit or hamster bedding, egg shells, and plant and pruning remains. Avoid adding meat, cat or dog waste, feminine napkins, disposable diapers, or glossy magazines. • Alternate grass cuttings with other organic matter in layers of approximately four inches. Parents encourage their children to eat bananas for its nutrients such as potassium. Banana peels are good to feed your vegetable garden as well. The peel provides calcium, sodium, sulfur, magnesium, phosphates, and silica. The skin rots quickly which aids to speed up the compost procedure. I promise to use it only to send you Get the Dirt. Easy tips for growing dill in a home vegetable, kitchen, or herb garden. Learn how to plant, grow, care for, and harvest dill plants when backyard vegetable gardening. 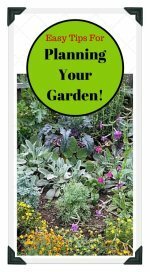 Vegetable garden pictures and videos to help you get started planting a garden. Gardening pictures can help you plan your garden whether a raised bed, container, or traditional backyard home garden. Use our free zone chart and guide for vegetable gardening planting times, to plan your next garden. Whether planting seeds or transplants, learn when to start. 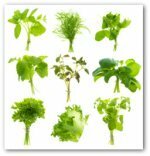 Copyright 2018 Vegetable Gardening Online. All rights reserved.